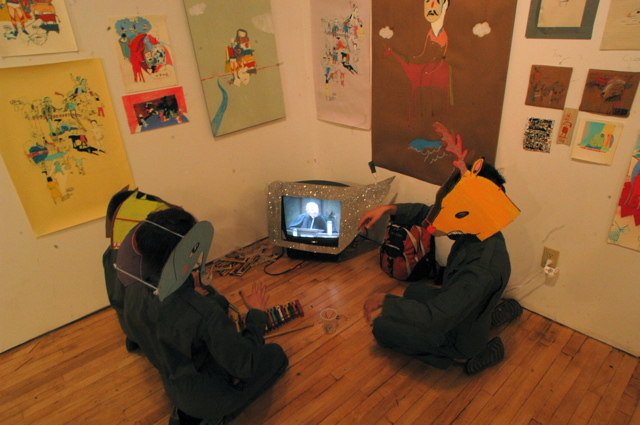 Big Car Collaborative, an interdisciplinary arts organization focused on socially engaged art and cultural community development, formed in 2003 and became a nonprofit in 2004. Our founders were a group of writers, musicians, and visual artists sharing a studio that doubled as a gallery space in the Fountain Square neighborhood. We operated this space with monthly exhibits for seven years. In 2006, we began inviting community collaboration and interaction, moving events and projects into public spaces in the neighborhood and at locations like Central Library and the Indianapolis Museum of Art. In 2009, we received our first large grant for site-specific social practice projects in eight neighborhoods. During this work, we discovered a vacant tire shop in front of a half-empty shopping mall. For three years, we transformed this eyesore with a parking lot garden, art, and community and immigrant-focused programs. We followed this in 2014 with a commissioned public art project that took us across the US to install 10 collaboratively painted murals in public places. In 2015, we brought a successful three-month public programming and tactical urbanism project to Monument Circle. This $400,000, NEA-funded collaboration with the City led to further placemaking work at City Market, Indiana State Fair, and locations around Indiana. In May of 2016, we opened Tube Factory, a contemporary art museum doubling as a community space in an industrial building south of Downtown. Tube is part of a campus of 15 buildings we own or co-own on one mixed-use block. These include Listen Hear — our sound art space and home of our FM broadcast radio station — seven formerly vacant houses serving as space for artists, five houses sold as affordable artist housing, a sculpture garden in three merged former back yards, and a 40,000-square-foot factory that will soon house studios and performance space. Big Car started in a classroom, a newsroom, a bathroom. It was early 2004. I was working several jobs to piece together a living for our young family in Fountain Square. One of those jobs was teaching creative writing on Saturday mornings to IUPUI students, many my age or older, who really wanted to learn. I also worked as staff photographer at NUVO Newsweekly, allowing me the chance to meet lots of great people in the arts, government, and philanthropy in our city. I snapped their pictures, heard their stories, visited their offices and studios and homes. And many became my friends, too. On top of all that, I spent every day with a staff of multitalented writers, designers, and artists right there at NUVO. Soon, we moved from the bathroom into a larger studio space, pooling our money and sharing the room with belly dancers, a visiting artist from Hungary and a local record label, to make rent. Meanwhile, we brought First Fridays to Fountain Square and worked hard, then as volunteers, to do what artists can do to help turn our neighborhood around. That happened. And Big Car continues to thrive in this friend-based, collaborative, multi-disciplinary, yes-saying way. After a few years of operating mostly as a board-run all-volunteer organization, a handful of big-vision people helped us grow up and into a full-fledged nonprofit. First, Ken Honeywell hired me to work for him at his new marketing company in Fountain Square. There, I was able to split my time venturing into nonprofits myself, including working on Big Car, while also learning about nonprofits from the inside by writing about Well Done’s clients, including LISC and their quality of life plans. In 2009, Big Car received a $50,000 GINI Imagine Big grant from the Indianapolis Neighborhood Resource Center. With the guidance of Marc McAleavey, then at the INRC, we completed social practice projects in eight neighborhoods — all with no paid staff time. Then we found Service Center in Lafayette Square and began receiving support from the Indianapolis Foundation and enjoyed the mentorship CICF’s president, Brian Payne. At that same time, the Allen Whitehill Clowes Charitable Foundation began supporting us too. Then, Jeremy Efroymson, of the Efroymson Family Fund — who, along with the Arts Council of Indianapolis, was the first to back Big Car in early years — granted us a three-year gift so I could begin working as our first full-time employee and executive director. This grant that started in 2011, allowed me to focus on Big Car programming, fundraising, and strategy. In 2015 we moved to our home base to the Garfield Park neighborhood — accomplishing much as the city’s only full-time socially engaged art and placemaking organization. We brought Spark to Monument Circle in partnership with the City of Indianapolis and CICF (funded by the NEA), began working from Tube Factory in Garfield Park, and reached more than 30,000 people with projects and programs around the city. We provided part- and full-time work to more than 50 artists, sparked major investment in a long-overlooked area of the city, and helped bring vibrancy to several underutilized public places near our waterways and in the heart of Downtown. In 2016 and 2017, we continued to build out and program Tube Factory art space, Listen Hear, and Guichelaar Gallery as well as program placemaking projects at Indianapolis City Market and other locations around the city and state. We ended 2018 with exciting news of a $3 million grant from Lilly Endowment for our work on the near southside. This capped a year filled with learning and sharing, bringing people together, and sparking creativity for thousands of people through our multidisciplinary art and cultural community development projects and programs.